Since New Year’s Day falls on a Sunday, we’ve decided to break up our event over 2 days so folks can get to church on Sunday morning. This also means extra sleep and rest! Six of us brave riders meet at the Overlook: Jesse Warda, Kayden Kelly, Mike Bradley, Trixie Bradley, Troy Soares and myself. It’s sunny and not terribly cold…I don’t have my cold weather jacket on which is a good sign! Before we get to the climbs, we ride our traditional warmup loop down AF to Powerhouse or Newcastle, through town, and then down Hwy 49 to the start of the Old Foresthill climb. I’m feeling pretty good but the hill will reveal the truth! After Mike Bradley starts, it’s my turn. Ready, set, go! Not too far into it, my legs and lungs are screaming at me. This is almost ALWAYS the case on this climb. I just try to ignore it and push on. I know that Trixie is coming soon so I’m riding like I want to get away. I hope to get to Mammoth Bar in 10 min. I’d like to be at the top under 18 minutes so I know getting to Mammoth Bar in 10 is a good benchmark for that. I pass about the 1/3 mark and Mike. “Good job Mike!”. I can see orange, it’s Trixie…go! I make it to Mammoth Bar in 10 min, yeah! Just another tough 100 yrds and it gets better! Dig, dig, dig! I look back and see orange and someone else. I push even more. It levels out so I get down into my drops (lower part of handlebars), put my head down and pick it up. I’m flying and it’s fun! It starts to go up again and I sense someone coming. Jesse flies by and then Kayden. Can I hold off Troy? No, he gets me too! Almost held them off! I’m going to be under 18 min, yeah! The stop sign is just ahead and I try to push hard but my legs are feeling flat. Go! I dig deep and am done! 17:32! Troy and then Trixie finish up. Soon after Mike is here. Now it’s off to the Foresthill Bridge! Once at the bridge we line up in the order we finished on Old Foresthill Road. Trixie is in front of me because her climb was faster, she just started farther behind me. Ready, set, go! Off we go pacelining across the bridge. I get a little behind and have to push to get on Trixie’s wheel. Once across Kayden, Jesse and Troy take off. Trixie pulls ahead. Come on legs and lungs! Again I must ignore them and push through. I catch up to Trixie about halfway up the hill. There are about six road signs ahead that I always focus on. Each one brings me closer to the end. So nice to be done for the day! Now we can have some great recovery going into the Resolution Run! So great to start out the New Year at church! I ignore my nerves while listening to Pastor Eric Van Patten preach and soak in God’s word! After church is done, my nerves kick in which really means I’m ready to roll! It’s looking like rain but it could hold off. It’s also pretty chilly. We left a car close to the start before church in case it pours and we need a place to huddle before and after the race. This year Ariel is running the 5K all by herself. Troy and her have worked out a secret goal that I don’t even know about. She seems excited to go for it. Anna is super excited to run the 10K. She’s been so motivated to train and race. It’s very cool but I just hope it stays fun! Troy and I warm-up while the girls stay warm in the car. I’m feeling good but I know that I’m lacking speed work and some endurance. We missed our track workout since we were in San Diego for Christmas. I haven’t been on a good schedule and have missed some runs. We’ll see how it goes! I’d like to run 8:17 pace like last year. It’s chilly so I’m wearing 3 layers on top, gloves and a beanie. I hope it’s not too much! Troy and I start first, 15 min later is Anna and 30 min later is Ariel. Ready, set, go! Troy takes off and I try to get into a good rhythm. We are a huge stampede heading down towards Railhead. A big truck is coming at us but quickly pulls over…phew! We turn off the main road and head towards China Bar. I think I’m going faster than last year already! Maybe my legs can go fast! Mile 1 is 6:48. Great! Kayden passes me. “Good job Kayden!” I plan on trying to keep him in my sights. Mile 2 is 7:13. Down, down, down. We are approaching my favorite climb, Cardiac Bypass. Here we go! This is where I usually catch runners and I hope to catch Kayden and the 2 girls I see ahead of me. A quarter of the way up I’m passed by a guy…that’s a surprise! As I continue I seem to be maintaining the same distance from everyone. I’m pushing it and my heartrate reveals it. I really have a hard time holding back here. I love to catch people so I keep digging. Finally, as I pass the halfway point, I catch one girl. 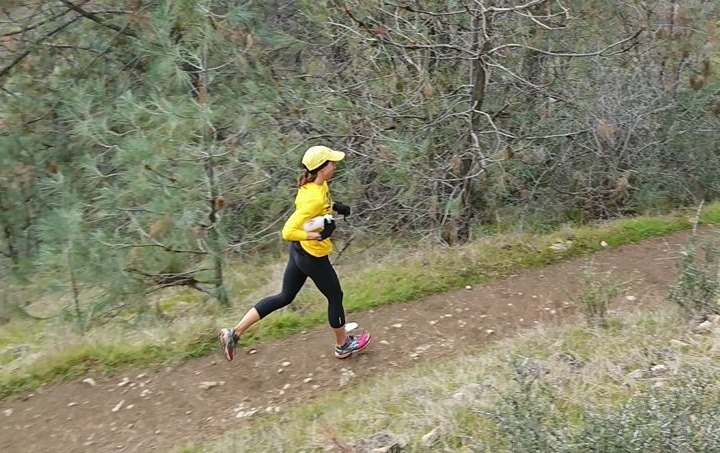 The other girl is visible ahead but she continues to run strong. As I approach the top, I get a few more…but not the ones I was hoping. More hills to come! Mile 3 is 8:36. Alright! Going faster than last year I think so I’ll take it! Mile 4 is 8:13. Heading down the long and steep Dam Road! I expect the top 5Kers to go by soon. A kid and a guy from my race goes by. I get passed generally going downhill so hope to catch them once it goes up soon. Kayden and that other girl are nowhere in sight. We turn off the road and are back on the trails. Time to get the legs used to climbing again! Mile 5 is 7:32. Three 5k guys fly by. The sun is actually out! I’m feeling warm and regreting the 3rd layer. I pass the kid and tell him good job! Feeling tired! Not feeling as strong on this climb. I think I might have overdone it on Cardiac Bypass. Mile 6 is 8:56. My pace has definitely slowed. Sometimes I feel at this point of the race that I wish it is over but fortunately not yet! There must be something left. Here come the 10K runners! I hope to see Anna! Here comes Emerson! Emerson is Anna’s best friend Leah’s brother. “Go Emerson!” And soon I see Anna way up there with our friend Mo Bartley! “Go Anna, go Mo!” She’s got a big smile on her face…love it! I’m so impressed she’s able to keep up with a fast gal like Mo! Mile 7 is 8:40. As I continue to head out, I look for Kayden and that gal. It’s not until almost the green gate that I see Kayden and that girl heading back. Though they don’t seem too far ahead, I think they’ve got a few minutes on me. And I’m not feeling so strong so it will be hard to catch them! I finally make the turn at the gate. As I head back, I see a girl coming fast. Uh oh, I’ve got to hold my place! Go! It actually helps me pick it up! Mile 8 is 8:10. I’ve got to run up these last hills as fast as I can. I hope to have more energy than the girl gaining on me at least! I push it up Robie Point. There is no one visually to catch but I run well. The downhill on the other side is slow…too scared of falling! I look back and that girl is right on me! Yikes! I’ve got 3 hills to get up hopefully ahead of her. I push hard to get to the next hill first. I just push. As I pass walkers and slower runners, I say “2 on your left”…I pave the way for both of us because I don’t want to block or impede her race in any way. She sticks with me on the first hill. Mile 9 is 8:54. I push the flats and continue to call out to walkers and runners. I can sense her still there. On the 2nd hill, I push hard again. At the top, I keep calling out “2 on your left” but as I look back it’s just me! Go! I try to push the flat. I get to the last hill that takes me up to the finish. I can do this! I push hard up and out. I hear Troy and the girls cheering me on! Go, go! Mile 10 is 9:34. 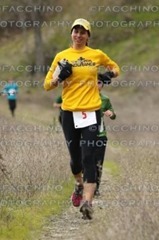 I dig deep and make it to the line ahead of that girl! Yeah! I didn’t catch Kayden or that other gal, but I’m really happy to have persevered in the end! I wait for that girl to finish and congratulate her. Thank you Lord for getting me through!